What Are The Worst Conditions In Which You've Ever Had To Fix A Car? December is here, meaning Michigan has shifted into a wintry hellscape. 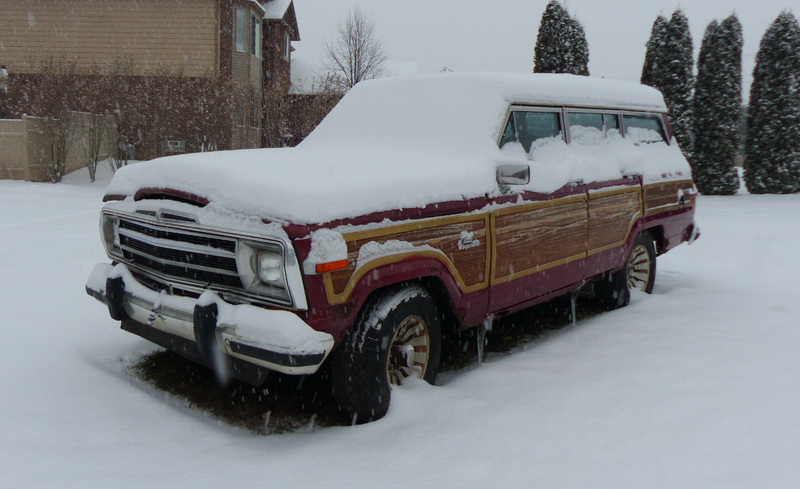 And, because of some poor planning on my end, I’m now wrenching on my $800 Jeep Grand Wagoneer in my rock-solid, snow-covered backyard instead of in my garage. It’s true misery. Looking at that photo above, I’m reminded that my garage is a bit of an oily shithole, anyway. So it’s just as well that I’m stuck wrenching in my yard in 20 degree weather. Still, I keep dropping sockets into snow, and it takes five minutes to find them. Also, every time I grab a wrench or any metal part on my Jeep, my hand goes numb. That’s normal, right? Unfortunately, I’ll be traveling a lot in December and January, and since the Easter Jeep Safari is earlier this year (it’s in late March), I can say with certainty that I’m already way behind on getting this Grand Wagoneer ready to not just off-road, but tow the Willys 1700 miles. The plan was to get the woodie into my garage so I could walk in there during work breaks and tinker a bit. But now, after The Great Fire Of 2017 set me back a bit, there’ no way in hell I’m just nonchalantly going to wrench on the SJ-platform Jeep. Any work I do in these conditions requires at least an hour of loin-girding, another hour motivating myself by listening to the sweet rumble of a running AMC 360 on YouTube, and maybe a look at that motivation Shia LaBeouf video. Suffice it to say, progress is slow over here on Michigan’s premier hospital for ailing Jeeps. But I’m sure I’m just being a baby, and that many of y’all have had to deal with worse. So let’s hear it: what’s the worst environment you’ve ever hard to wrench in?